The real P-09 Duty is a polymer framed full size pistol from Ceska zbrojovka Uhersky Brod, which is far too much of a mouthful for those of us not from the Czech Republic, so we'll just call them CZ. Well, CZ put together an extremely fine pistol, and it's gathering use in the self defense and law enforcement community due to its extremely ergonomic design, great reliability, impressive accuracy, large 19+1 capacity, and most importantly to the guys in charge of writing checks, a relatively low price. 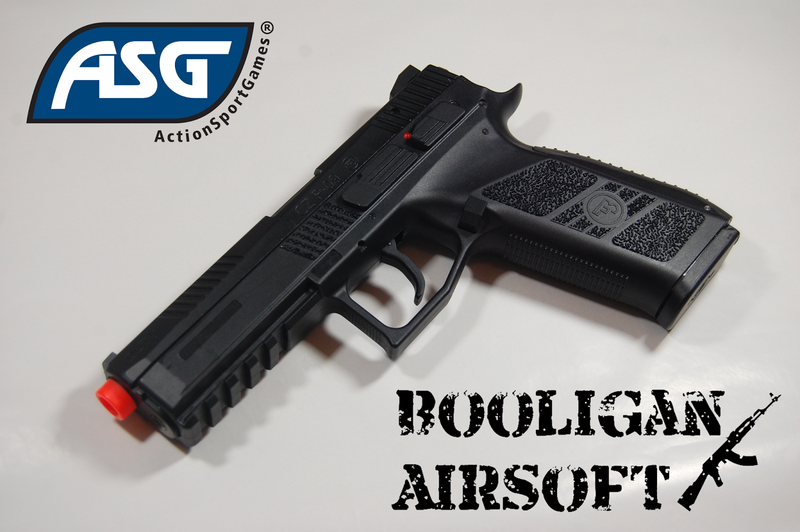 As the holder of the CZ licensing in the US for airsoft replicas, ActionSportGames (or ASG, because acronyms are cool) has contracted with KJW to put together a faithful replica for the airsoft market. And here it is! Let's dive inside this gorgeous Czech designed handgun and see what she brings to the table. This gun was sent directly by ASG who does not normally do direct sales, instead serving as a distributor to get this gun into retail stores. Retail price appears to be $129.99 at the time of this review. Thankfully, unlike some other licensed airsoft replicas from other companies, the P-09 is free from large obtrusive warnings printed on the gun. The P-09 is a gas blowback, polymer framed, hammer equipped full sized pistol. It has an ambidextrous safety switch located on the frame as well as aggressive texturing on the grip and frame in key locations. A long front rail allows you to mount accessories as desired, and white painted three-dot iron sights allow you to easily aim at your targets. Unlike most semi-automatic pistols, the slide rides inside the frame, allowing you get a higher grip on the frame while shooting for better shot to shot accuracy. An extended beavertail at the rear of the frame also allows for a higher grip and prevents "slide bite" while shooting. The pistol is just a good design, plain and simple. I was pleasantly surprised to see that the ASG P-09 came in its own hard case with custom foam cutouts for the gun and a spare magazine. With this package, ASG included a standard and CO2 magazine for testing, however, the CO2 magazine is normally an accessory that you must purchase seperately. I was a bit taken aback by the size of the P09, it's a very large handgun, about the same size as my SIG X-Five pistol, however, once I held it and got my grip position squared away, I was very happy to see that it hides its size in your hand very well. The pistol fits my gorilla mitts extremely well. Along with the pistol itself, ASG includes a single magazine, normally the green gas/propane model. I have seen this gun for sale listed as the "CO2 Blowback Version", and these models may be coming with the CO2 mag instead of the green gas version. I am working to confirm this now. Other than the pistol and the case, there's not much else included, other than a manual that does a good job explaining the functions of the gun and how to do basic maintenance on it. The first thing that can be said about the P-09's externals is that it is a big gun. Seriously, this thing is bigger than you think it is, I promise. Now, it's not a Desert Eagle, but if you're used to Glocks and M&Ps, you'll find this a smidge larger. Visually, it looks amazing. The polymer material used on the frame looks perfect and meshes well with the matte black finish on the metal slide. Only on closer look can you see any defects on the metal slide, in the form of barely visible casting marks. As I always say, a pistol is only as good as its grip, and I'm happy to report that the P-09's grip is superb. Thick, but not too thick. Textured, but only in the right places. It appears to have a swappable backstrap system, but no extra backstraps are included. At the base of the grip, you'll find a lanyard loop which also serves as the main action spring retainer. The controls are quite simple, consisting of a very crisp trigger capable of firing in single or double action modes, an ambidextrous safety lever, left sided magazine release button and a slide catch/takedown lever located on the left side. The hammer is exposed as well, and can be lowered with your thumb to bring the gun to double action mode. There is no mechanical de-cocker. The frame of the gun also has two spots of aggressive texturing located above the trigger. These spots are very handy for your off shooting thumb to index with a high grip, and for your trigger finger to rest on the other side when not on the trigger. The texturing might be a little too aggressive, and shooting without gloves can rough up your thumb a little bit. The front of the frame has a five slot 20mm rail for mounting lights, lasers, or other accessories of your choosing. The rail is made to spec and all of my accessories fit with ease. The metal slide rides inside the frame on extended rails which is a pro and a con in my book. You can get a higher grip with higher thumb placement with this type of slide, but you have less slide to grab onto when you need to cycle it. To assist with slide manipulation, cocking serrations are located both front and rear for most shooting styles. The outer barrel is metal and properly tilts when firing. It is fitted with an orange plastic plug which appears to be glued in place and primed for self destruction if I try to remove it. It'll stay, for now. Aiming the P-09 is a simple task thanks to its easy to acquire white painted three-dot sights. The front sight appears to be removable, but the rear does not appear to be adjustable, even after loosening the hex screw on top. One of the perks of this pistol is ASG's ability to apply licensed and legal trademarks to it, which they have tastefully done. The markings on the slide are very well applied, as well as the raised marks on the frame. A very small ASG and Made in Taiwan mark can be found on the right side of the frame. The pistol we're reviewing today came with both the CO2 and green gas magazines. Both hold 25 rounds, and both feature properly licensed markings on the baseplate. There is no mechanism in place to hold the follower down while loading, so you must hold it down as you load the BBs, ensuring that the rounds properly stagger for correct feeding and maximum BB capacity. A quick note on gas efficiency, the gas magazine gave me about 32 rounds per gas fill on average, firing 3-4 rounds rapidly, then waiting 30-40 seconds to let the magazine get back up to temp. Plan on re-gassing it when you refill it with BBs. The CO2 mag, on the other hand, gave me 75 rounds per 12g capsule, using the same firing sequence. FPS is a little high, but certainly at a reasonable level for most field use, especially with the propane/green gas mag. The CO2 mag was slightly more consistent (that 320 FPS propane shot was an odd low shot out of a very consistent string of shots) and will be well suited for cold weather use. I will note that the trigger pull is one of the best I've felt on a GBB pistol. The travel is fairly long, about 9mm total, but is very lightweight and predictable. The break never sneaks up on you. Range and accuracy, using ASG .20g Devil BBs was pretty good for a pistol, easily allowing me to get hits on my torso sized target out to 100'. Unfortunately, I could never get my hop-up dialed in all the way, and that robbed me of usable range. The rounds have plenty of power, but they seem to just fall short due to the hop-up. It seems that I could tighten it up using the little dial that you'll see in the next section, but it would basically reset itself once I hit the sweet spot. It could be an issue with my individual hop-up being machined out of spec, but it seems like it's just not working on mine. I plan on tinkering with it a bit more. That being said, 100' accurate range is certainly nothing to scoff at, but I realistically think this thing could reach out to 125-130' accurately with a properly set up hop-up. UPDATE: Turns out, there is a hop-up defect on the very early models which haven't really made their way out to anyone but reviewers and a few early customers. ASG has caught this defect and has a fix on order, so if you have an early P-09 with hop-up issues, contact ASG to have it sorted out. After issuing the fix on my gun, I was able to adjust the hop-up to the point where I was getting torso accurate shots out to 120' using .25g Devil BBs, a 25 foot improvement over before. Stripping the P-09 is a very simple affair. First, you must remove the magazine by pressing the magazine release button. You can then move the slide back slightly, lining the notch in the slide with the line on the frame. Holding this position, you can then push the slide lock lever out of the gun from the right side. This will then allow the slide to move forward, off of the frame. From this position, you can adjust the hop-up (see my notes above) and also lube up the important moving bits. I like to use Murder Oil for this, heavy for the frame rails and medium for the blowback chamber itself. The blowback chamber is made out of a polymer material and has a large red o-ring inside the chamber. It slides very smoothly and freely, no spring binding here. The hammer assembly is located in the frame and appears to be well manufactured. The mag valve striker is extremely well made and seems like it should last for quite some time without needing replacement. The polymer frame of the gun has a metal inner structure for strength and durability. The barrel and hop-up are a bit tricky to fully disassembly. First, you must remove the inner barrel and hop-up unit from the outer barrel, which requires you to tap out a VERY stiff roll pin. Once that is removed, you can slide the inner barrel out of the outer barrel assembly. Once removed, you can unscrew two tiny phillips head screws and open up the hop-up unit. The barrel appears to be a standard TM type pistol barrel, so upgrades should be quite simple. The hop-up bucking, however, looks to be non-standard, as it uses two anti-rotation nubs instead of one. I'm not sure what consequences, if any, there will be if you run a standard bucking with only one nub. The spring guide is made of metal and is very well machined, with a good strength spring. At the end of the guide, you'll find a metal washer and rubber bumper, ensure these are reinstalled when you put the gun back together. Also, when you slide the slide back onto the frame, you will need to push a little nub down on the left side, in front of the hammer. You'll see what I mean when you get to it. I don't tend to tinker with my GBB pistols too much, but I might be tweaking this one a bit to get it to shoot slower. Crazy, I know, but I like my sidearms in the low 300 FPS range. I might accomplish this by porting the inner barrel, which would give me the great blowback recoil force that this has, but with a lower FPS. As far as holstering the gun, there are a few options out there, and strangely enough, the Blackhawk! USP SERPA holster that I previously reviewed HERE fits it quite well, only slightly rubbing on the front frame texturing. Not sure if that will be the case with all USP holsters, but for this specific one, it fits nicely. The gun shoots a little hot with the CO2 mag, but right on the money with the green gas mag. I've always been impressed with KJW's GBB pistol offerings, so I figured the ASG licensed P-09 would be a solid gun. I'm happy to report that I wasn't wrong in that assessment! The gun is very solid and extremely well made, and externally, I have almost zero criticism. My first test gun had velocity and hop-up issues, however, this was rectified by ASG, and the guns that you'll find for sale should fall in line with the updated performance info in this review. The gun just works, it does a good job on the field, and will find a nice home in one of my holsters! Many thanks again to ASG, and of course, Airsoft Retreat! I've got one and it's very true it's too hot even for it's externals! The white point from the front sight got out after a few shots while using CO2! And the worst part is related to the front sight as well, which I lost after I had drawn it for several times! There's no screw to fix it and it gets out very easily, I've noticed! Otherwise, it is a very realistic gun! Be careful with the front sight!